5 Flight Stands with Pointers. 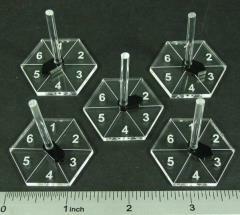 The half scale angel air combat flight stand is a 1.25 inch hex flight stand with 1.5 inch peg. It is engraved with the six flight speeds used during the game. An included pointer is used to track the current plane speed. This flight stand and peg are compatible with all LITKO flight stand pegs and accessories. These flight stands are designed for use with the Axis & Allies* Air Force Miniatures: Angels 20** game system, and allows you to use smaller 1/285 or smaller scale plane models with your games.